When I was getting ready to host poetry night, I remembered a large box upstairs that my sister and mother packed and sent to me several years ago, long before my mother died. They were sorting through things, and asked me what I would like. I’d tried to open and look at everything in the box a couple of times over the years, but the things were fragile, my hands unsteady, and the memories powerful. I had no ready place to put them, so they stayed in the box. But that afternoon, I thought I remembered there might be a few wine glasses in the box, so I made my way upstairs to investigate. It turned out there were no wine glasses along with the fancy tea set I remembered was also in there, something from Japan my mother used on special occasions that I had loved as a little girl. I decided to take the cups and saucers out and use them for refreshments. One of the cups had broken, but everything else was intact. And then I found something nestled in bubble wrap I had not expected to find. This little painted egg. The moment I read this inscription again was one of those moments when several different buds from the past open their blooms in the present moment all at once. Nothing happens until it is the right time, and the right moment for me to be given this message in this particular way on this particular painted egg had arrived. It seemed as if it had been painted by my teacher so someday it would end up here, in my dining room, in my hand, on a sun-filled afternoon, in a town she had once lived in, where people accepted her when she was young and in need, something I would not know about her until the last time we talked on the phone before she died. As if the words had been so carefully painted on it so that someday they would seem so matter of fact to me that I could only nod in speechless wonder about how profound an affirmation they are of how I live my life. Nobody could have ever told me this was where I would end up at the time this egg was painted, and for many many years after that. But now I am here, and I am in awe of how it survived the bumps and tosses of a 1500 mile trip and then sat in silence for years until the moment I decided to really open the box and let everything in it see the full light of my day. 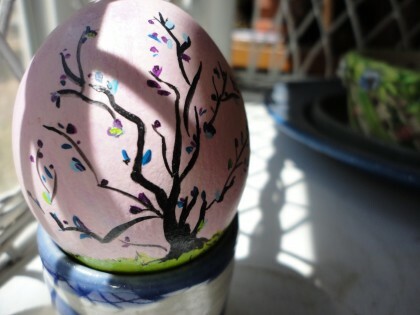 This next photo is of an object not nearly as rare and beautiful as the painted egg, but in a way it is. Remember those 3 gallon water bottles that I can now lift myself? (If not, you can read about that in the post Zen Chores.) This is the pull top off of one of those. And this morning, before lifting the bottle off the chair next to the water dispenser, I found myself pulling the tab to remove this with my right hand. When I was 4, the orthopedist told my mother I needed to be forced to use my right hand, to encourage it not to curl up against my side, as limbs often do when affected by the spasticity of cerebral palsy. To this end, I was required to hammer in wooden pegs with a toy hammer with it while my left one, the strong “normal” one, was held behind my back. I did not like this at all, because I wanted to succeed and knew I could knock them right in with my left hand. I cried when I had to do it. But I did it. More than 50 years later, after reading Dr. Doidge’s amazing book The Brain That Changes Itself, I wonder what my orthopedist knew about the school of thought that argued for the plasticity of the brain. I don’t think Edward Taub had yet worked out his program of rehabilitation for stroke victims that involves this very kind of technique. I’ll be reading the book again, and most likely referring to it in the future, but for now I’ll just say it made me value all over again in a new light the times in my life I was challenged to use my right hand instead of my left. I learned to use my right hand begrudgingly, by playing the piano, by doing the exercises (like driving in the pegs) I was required to practice, and by knowing it was necessary if I wanted to learn how to do very basic things like balance on a two wheel bike or swim. But I wouldn’t learn to appreciate it might have something to tell me, a beauty of its own, until decades later. When I was in my early 30’s, I found myself in cognitive talking therapy with an amazing woman. Part of what I did during that very important time was try to draw with my right hand as a way of connecting myself back to more ease of access to my creativity. I still have the stunning drawing I did completely with my right hand. At first I thought I was only able to scribble, but then the scribble became this lovely ballerina, reaching up to something larger. the grace of which I have not been able to replicate ever with my left hand. I like to think there’s still a ballerina waiting in this hand. She knows patience, hard work, waiting, and the value of training. She is gentle, but strong in a way beyond physical strength. She waits in the wings, hoping to be asked to dance. But I still am in the habit of only calling on her when absolutely necessary. Now, more than ever, though, I’ll remember, and give her a turn at trying something when my left hand has had more than enough. One morning this week I had the 3 gallon water jug on the chair right next to the water crock, ready for the final lift. But first I needed to pull off the top. I had just picked kale and sprayed my greens with nettle spray to help deter the flea beetles and my left hand was tired from the sustained motion of working the spray bottle. It would be lifting the jug’s handle and pointing the neck of the bottle into the crock. So somehow I managed to allow my right hand to pull the tab on the top to see if It would open the water bottle. When I realized what I was doing, the old thought came: “no way is it strong enough to do this.” It stalled in weakness at exactly the place it usually does when asked to pull something this way, and I was about to stop before injuring it when it gathered momentum and kept going until I had pulled the entire top off completely with only my right hand. There’s something about the MS, and sometimes even the fibromyalgia, that makes me enjoy the experience of triumph over the expected limitations of those conditions. Perhaps I even gloat a bit. Like Peter Pan, I love to crow about those victories. Yet with cerebral palsy, however mild, it’s usually about the triumph of compensation, not ability. I could hardly believe my hand had quietly, gracefully, stretched itself past its own limit, and opened the water. Like a dancer balancing on one toe, and dipping low, the other leg pointed and high, arms in a graceful sweep. Strong; but delicate, precise. There was so little fanfare. Just the accomplishment. It put a lump in my throat. The same way it did when one morning, attempting to balance on my right foot for a tree pose, I felt, for the first time, my whole right foot on the ground, not turned in on itself in spasm. It was only for a few seconds, but I’d never felt it before. Ever. I teared up to feel my foot feel the ground all by itself with no left foot to spot it, even for those few seconds, both arms stretched straight up above my head. It really was a miracle. 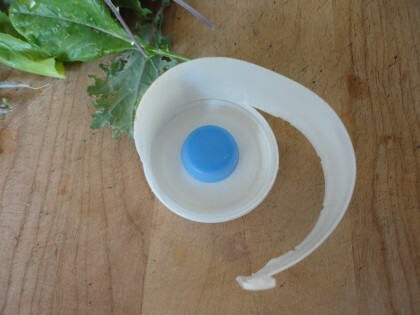 And so was this pulling open of the top on the water bottle. Often ignored, belittled, expected to compensate, getting-dragged-along right side. How delicately beautiful you are when you are finally able to show yourself. Like the life I’ve built for myself by finding joy in the tasks and requirements of my day. That includes the low fat plant- based way I now eat, and the simple way I prepare my whole food. The rhythm of the sun across the south windows. The things I must do. The things I try to do. A friend once told me Carlos Castaneda wrote that if you love the world you’re never lonely. By telling me this he meant to say that he thought I loved the world, and he wished he could learn how. I think about this from time to time and wonder. By loving the moments of my day as they unfold, they do indeed become my temple and my religion. Only I didn’t have the words for it until they came back to me in the calligraphy of someone loved and now gone, written on an empty shell. There’s not an egg inside that egg anymore. But its emptiness holds great beauty. And there’s no top on the water bottle, the water now emptied into the crock to be cooked with, to drink. Both rounded things emptied, swirling themselves into the temple of my day to let more light in, more grace, more chance to rejoice and give thanks for being alive. What a lovely post, Maria. Thank you for sharing your life with us. Thank you Linda, and welcome! A beautiful post, Maria! I loved hearing about the egg and the ballerina, too. And how the emptiness of some things makes way for others. Beautifully written! Gosh, you inspire this 53-year-old lady! Thank you! Welcome, Cara and thank you–it makes me happy to know this! I went for a walk in a new park today while waiting for my kitty to get groomed, and I just walked slowly, enjoying the breeze in the trees, the singing birds, the earth beneath my feet, and I thought to myself, “this world is a-ok, isn’t it.” And then I read your post. Thanks for this beautiful comment, Veronica, which means “the world” to me. I so loved picturing you walking slowly, enjoying your surroundings in this palpable way and deciding this world is “a-ok.” Glad to be connected to you in that spirit and in such magical timing. What poetry and grace! You are a ballerina of imagery, a conjuror of emotions brought to resonance in your reader; tempting the logic-bound mind to risk abandonment to feeling. Thank you, Kathleen. I am honored by this beautiful comment. what a lovely way to start the day…thank you dear Maria! How nice Maria. Loved your descriptions. Thanks so much, Beth! I’m so glad you loved the way I described this. Thank you for this lovely heads up to the interconnectedness I was hoping to get at, Silvia. I’m so glad you liked it! I truly believe that focus is one of the keys to my healing. Thank you so much for honoring it with your lovely comment. WOW. Seriously WOW. Holy Cow and Holy Cr*p and all the rest of the Holy-plus-another-Word! What serious magic is this diet? What will happen next?!?!? I am floored. Maybe even a little scared. Like Eleanor Roosevelt said, You must do the thing which you think you cannot do. Only it is more like, You WILL do the thing you thought you could never do, from a physiological standpoint. And minds will be blown. Crow away. You have an OBLIGATION to do so. Miracles must be reported. I am glad you are so kind to your dragged-along right side. It bet she appreciates it! Keeping the dear egg company in all it’s understated, spacious greatness. PS I love the dancer! I got distracted by the other things that I forgot to mention that! I am honored by this wonderful comment, Deborah. What a lovely way for me to end my day, as I turn off the computer for the night. Thank you. what a beautiful post. I love your ballernia picture – would love to have this in my office at work. Thank you so much, “your reader from texas” and welcome!! This is one of my favorite posts, so I really appreciate knowing you liked it too. 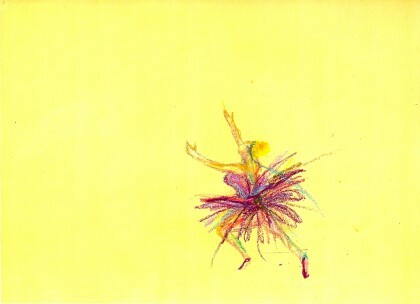 I have been considering adding a “Ballerina” print to my new online shop page here on the blog Slow Miracle Art Store. You are giving me a reason to follow through on that. I will let you know when that option is available. I’m honored you would want to hang it in your office.